What happens when you buy a bag of apples and don’t get around to eating them because you’ve behaved naughtily and eaten snacks that you shouldn’t instead of the bag of apples? Applesauce happens. Easy, quick, warm, yummy applesauce. Peel and cut apples into chunks. Boil apples until you can pierce through with a knife. Drain apples and leave in pan. Mash apples until desired chunkiness (I like em big, I like em chunky – if you get that quote you win!). Mix in agave and cinnamon. Serve warm! Or cold. Enjoy! 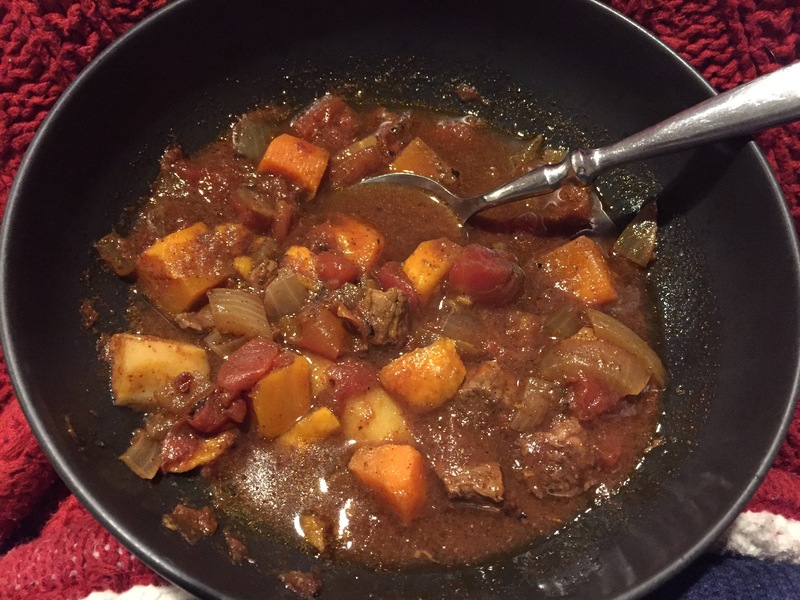 Witch’s Stew… is that even a thing? Now, I had no sabotages or time constraints. Just about 10 minutes of prep, 6 hours in a crockpot, and a bowl full of warm goodness to enjoy on a nice, crisp fall evening. Here’s hoping you get a chance to enjoy! You put all of that together in a crockpot and stir it up. 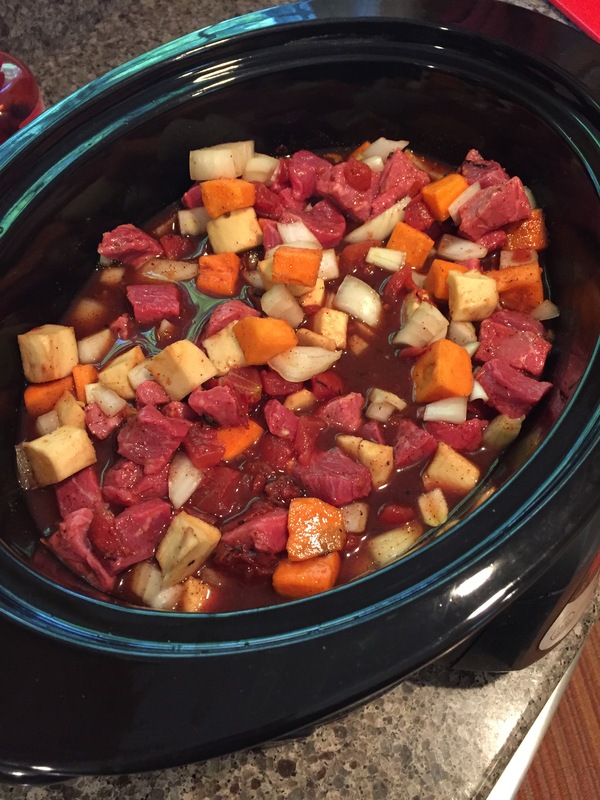 Then you put the crockpot on low, come back 6 hours later and scoop yourself a bowl of something awesome! This will feed you for a week, I promise! I remember the marvelous Sundays of my childhood when we got home after church and could smell amazingness (spellcheck isn’t arguing that word hmm) in the oven. That smell promised a day of sweatpants and football and naps. Ahhhh. I’m sure everyone has their own idea of that smell. For me it was these five, scrumptious letters: G-R-A-V-Y. Yesss anything with thick, home-cooked, flavorful, gravy. In search for that same level of goodness and comfort, I came across this sweet and savory, Fall-ish creation. Preheat oven to 375, grease a pan with 2 T olive oil and place pork chops in pan. Whisk together garlic, sage, balsamic vinegar, Dijon mustard, maple syrup, and salt. Spoon or brush mixture over pork chops. Pour the rest into the pan. Roast for 35-40 minutes or until fully cooked. My desire for comfort food was on 10 so I paired my chops with mashed butternut squash (cooking directions similar to spaghetti squash here) and corn. No butter needed! It is a yummy alternative to gravy-soaked mashed potatoes! This is my favorite time of the year! With no intention of sounding braggy, I have to share that grocery shopping at my parents’ farm is awesome!!! They work insane hours as they plan, plant, weed, harvest, and can tons of vegetables, most of which for the purpose of giving away! Those are some serious givers…but that’s another post entirely. Whether you have access to fresh groceries from a local farm or the grocery store, this is the time of the year for tomatoes and squash. Yum! In a pot, boil water and add tomatoes once boiling. Keep an eye on the tomatoes (few minutes) and remove them from the water once the skin has broken (a little slit in the skin). Dump the water. While the tomatoes are cooling, splash some olive oil in the pot and add the garlic. While the garlic is heating up, skin the tomatoes, and then slice them right into the pot. Add salt and pepper to taste. Hint: I tripled this recipe and used the rest to make Around The Way Chili. Preheat oven to 400. Slice the spaghetti squash, scoop out the seeds and lay face down in a greased pan. Bake for 25-40 min, or until the flesh is easily pierced with a knife. In a skillet, add the butter and garlic. Sautee the garlic until golden. Add in the shrimp and cook (6-10 min). Add the stewed tomatoes to the shrimp, along with red pepper flakes if you want a little kick. Now add the pulp from one can of coconut milk (save the milk for countless other recipes). Once the squash is done, scrape out of the skin using a fork. Return it to the shell if you’re feeling fancy (or need a pic for your blog). Cover with shrimp marinara and top with a little fresh basil. Yum! Enjoy! It is summer!!! Officially time for grilling and marinades. This quick recipe is incredible on any kind of meat. I got it from my mama so you know it’s good! Whisk the ingredients together and marinate the chicken for at least 3o minutes. My mama actually grilled the one below (thanks mom!). I paired it with some roasted asparagus from their garden (toss with olive oil, sprinkle with salt, 15 min at 400-degrees) and corn because it sounded good. This meal is sooo good and very quick…especially if you’re reheating from your mama’s cooking! Enjoy! My amazing husband is training to climb, hike, traverse, ice pick his way through Mount Rainier. He has become pretty boss at hiking and been doing a ton of training for this. Now, this means that I can spend my weekends at our home while he goes up to NH and we can constantly be a part, or I can make my way up to the White Mountains and hike with this stud. Here’s what I would like to say. Hiking is amazing. It’s absolutely beautiful and the fresh air is wonderful and the achievement factor is off the charts. See this face? This is the face that thinks these things. Look at her. She is naive and full of motivation to be awesome. Let’s talk to her in 5 miles, shall we? Where we see her at the top of the first of three peaks nourishing her very sore body with some almond butter (look at that, she’s even staying paleo on this hike!). That face is filled with optimism, because she reached the top. She will reach the top of two more peaks in this hike, all over 4000 feet, two over 5000. This is pretty awesome, she thinks. I can do this! And of course, she can. Because she has this stud with her to cheer her on. Here’s the thing though. While hiking really is awesome and it is pretty amazing, I must confess – I have a terrible mindset once I begin my hike down. This is because my knees have become the knees of an 80-year old and the pain is off the charts. Suddenly the beauty and fun get wiped away by the fact that I have 4 miles of jarring steps down on hard rocks before me. Oy. It is really hard, I mean really hard, to motivate your mind to push through when you are in pain, isn’t it? All of a sudden, my sarcasm comes out and the idea of having a great time gets wiped away as you realize that a 65-year old woman is pacing with you down the mountainside. Yep, that’s me, shooting the breeze as we discuss her retirement. Aarrrgggghhhhh!!!!!!!! Here’s what I know though – just because my body is different now and different than others who have no knee problems doesn’t take away from what I am achieving. We can constantly compare ourselves to whoever else is out there on the mountain or at the gym or even *gasp* in the mirror, or we can work as hard as we know how and then give it an extra 10% for good measure. Forget about what everyone else is achieving and enjoy what you are doing, because let’s face it, you are doing it! I hiked an 11-mile hike with 3-peaks with my wonderful husband. Yes, it was a LONG day, but I did it! And now, I have some knee braces and will attempt to do even more. Don’t let yourself get discouraged. Life is too short to wish you had done something as well as someone else. Do it as best as you can and enjoy the amazing views along the way! June is here! At the beginning of last month, I shared my S.M.A.R.T. goals for the month of May (you can get caught up by clicking here). Since December, I’ve been in an exercise slump. Life got busier and exercise (and sleep) got moved down the priority ladder. This is not a good practice. Especially when you spend most of your 13-hour days sitting and listening to people! I am so glad that I took on this challenge for the month. I can honestly say that I haven’t worked out this much all year long. So….drumroll….post a comment if you’re actually doing a drumroll right now….badadadadadadada….15 workouts completed (in ummmm 31 days because I was one short and needed to get it in at 9pm before I wrote this blog) and 7 pounds lost! I’m aiming for the same goals in June but with much harder workouts. The massage is still on the table for June!